Today is the grand day when I, for the first time in my memory, cooked a dish which was marginally edible. I hate cooking, but I love eating and since I grew tired of cold buffet meals, I was reduced to attempt the wooden spoon. Typically, I produce versions of tasteless pasta, hard rice, overcooked vegetables and burnt meat. I’m hysterical about undercooking food, except rice, because no self-respecting food should take more than fifteen minutes to prepare. I made wild rice and roasted pork cubes today. The rice improved a lot by having been boiled for twenty-five minutes, as suggested in the instructions on the box. I set my computer timer to measure the allotted time and went blogging. While multitasking, I also put the meat on the pan, seasoned it with a pinch of all spices I have (I never have more than three kinds at a time) and stirred occasionally. (See what I’m doing here? I’m blogging a recipe!!) Unlike my usual, this time I didn’t wait for the meat to get black (at least not most of it), which radically enhanced its eatability. The result was pleasantly shocking. I almost enjoyed the meal, though I fiercely hated cooking it. I won’t provide visual proof of my lunch because I’m the weird kind of person who eats her meals rather than taking pictures of it. Instead, see above for creepy wooden spoons. The scary effect is intentional. That’s how I feel about cooking. i. am. dying. laughing. And, I’m sad I don’t have a recipe card on which to write your recipes. I will remember though that black meat is a no no. And how weird would that be if someone actually used one of those spoons to cook with? It would be kind of sadistic. They should make the spoons with horrified, burn-victim facial expressions on them. That would make more sense to me. I’m happy to inspire 😉 But don’t put me in the Foodie Blogger category yet, let’s wait a little what I’ll come up with next. Maybe I’ll learn how to make tofu digestible. I keep on buying it for dietary reasons and I always forget I neither like it nor can I prepare it. 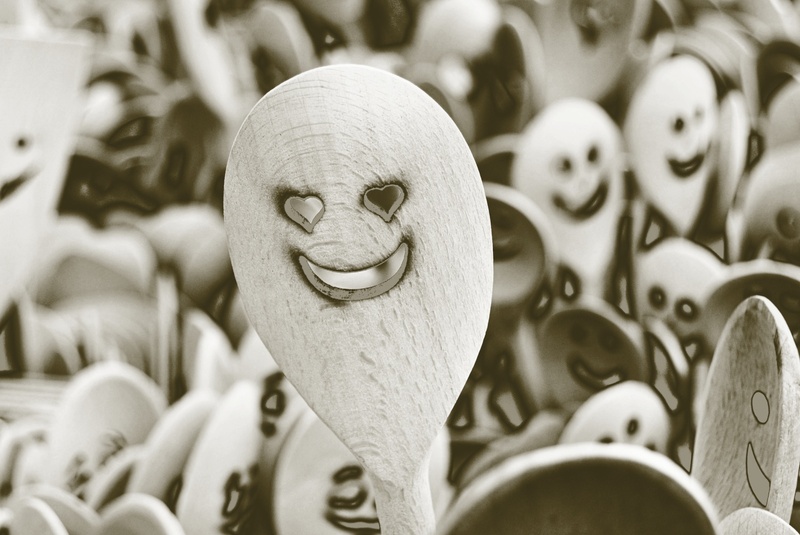 The spoons in the picture struck me as creepy rather than cute in the first place. They were even selling the burnt-out bits, the disembodied wooden mouths and eyes! I didn’t ask the seller what purpose they were supposed to have. Maybe woodoo. I’m happy to share my cooking adventures 😉 Doesn’t the spoon scare you? I found it frightening the moment I saw it! I took the picture at a stall, I don’t own the product because I doubt it would increase my willingness to cook, quite the contrary. The older I get, the more I loathe cooking. So happy for you, you managed produce an edible meal. Cooking rice can be difficult, I buy those bags you put in the microwave. They keep getting better all the time, now they come in some cheddar cheese taste. Some time I’ll write about when I tried to make lasagna myself. Microwave rice?! Damn it, I so want to live in a civilised (that is, developed) country. Never saw these here. Have a hard time getting the kind of rice I want, and even a harder time getting the right kind bagged in portions rather than just loose in the box. I hope to hear your lasagna story soon! I’d never dare to attempt anything as complex. They certainly do … Would they ship? That’s the big question … don’t know what the rules are. Oh, I didn’t realise you can actually get food on Amazon… Now how funny would that be to get my groceries shipped. Probably not very expedient though. So, I checked the UK Amazon, which is where I shop for books published in UK, and they won’t deliver alcohol but will deliver some groceries here… It’s mostly just sweets though, no actual food. So I think I’ll have to get my food the old way. And I’ll have to struggle not to order a selection of cookies, which is my favourite no-food. Meanwhile, I gave up my idea of ordering groceries on Amazon because it’s three times more expensive plus delivery costs. Yeah, the shipping costs are the worst! I wish I discovered some fun in cooking, but I still don’t get it how some people can like to cook. And wash the dishes afterwards… Maybe I should read more foodie blogs! Nah, they’re just depressing, unless you’re looking for inspiration and not expecting to emulate all the gorgeous looking stuff 🙂 I’m with you, the dishes is the least likeable thing about it all! Those spoons are very creepy. I have many wooden spoons (hmmm … maybe I have a spoon-thing), but thankfully none look like this!! Hehe, congrats on the meal. 🙂 I love cooking. My favorite time of cooking is the weekends, because then I have time to cook for hours. You voluntarily cook for hours?! My love for eating is only matched by my hatred for cooking. That’s funny. I just wrote something similar for my blog. It is funny, the way the same inspiration comes to multiple bloggers at the same time 🙂 It must be some cooking vibe in the air.